I have been shooting some videos of bands and although I have a decent stand, when it is raised all the way up it is about eye level. Anyone walking in front of the stand is in the way. I had the stand on an equipment box which raised it about 6 inches and didn't have any problems with people walking in front of camera. Is there any attachment that I can attach between top of stand (boot) and camcorder that will give me about 6 more inches of height? I don't know the answer to your specific question. If B & H photo doesn't have what you're looking for, my uneducated guess is it doesn't exist. The way I video over people's heads is to mount my camera to a 8-10' light stand that I also use for my microphones. I also clamp my DR60d to the same stand and run an audio feed from it into my camera. I don't pan or zoom in and out. I just let the camera run on the stand. That would work if your threads are 3/8-16, and with adapters if your tripod and camera have 1/4-20 threading. If they have 1/4-20 a less expensive alternative would be a trip to your local hardware store/home center for a coupling nut and a piece of 1/4-20 all-thread. Screw the coupling nut on the tripod and the all-thread into the coupling nut and mount the camera on top. Since most all-thread is sold in 3' pieces use a hacksaw to cut it to the length(s) you want, multiple pieces and still cheaper than ordering from B&H. I use this on my mic stand. I wasn't familiar with "coupling nut" and "all-thread." I looked them up and it all makes sense now. Lock the coupling nut to the section of all-thread with a normal nut (or a lock-nut) torqued down against the coupler, or with a thread-locking compound such as Locktite red. You can cover the all-tread and nust with heatshrink for a nice dark charcoal-gray matt finish. 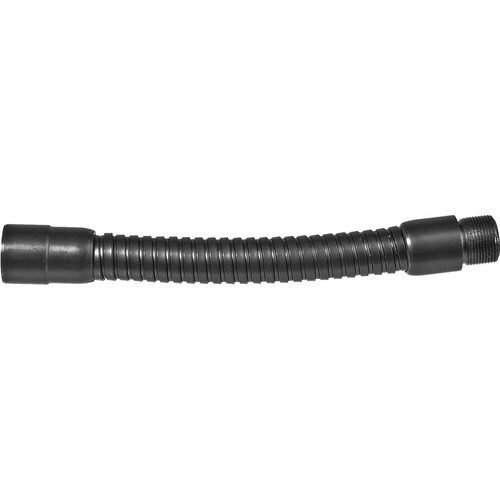 Then a 6-inch gooseneck with a 5/8-27 to 1/4-20 adapter. http://www.bhphotovideo.com/c/product/82408-REG/Atlas_Sound_GN_6E_GN_6E_Gooseneck_Extension.html The gooseneck is rigid enough to stay in place and still allows plenty of room to adjust the angle of the camera. The gooseneck extension looks nice - but I can't help but wonder how well it holds up to a thumping bass or pounding bass drum. Any camera jitter when you use it? Gooseneck extensions vary in tightness. That one is so short that it's probably pretty rigid. With use over time, the longer ones tend to loosen up. Cameras that have built in stabilization apparently depend on a built in gyro that can be shaken by loud bass/drums, and may need to be turned off. Are you using a tripod? Legs out all the way? If so there should be a center shaft that the leg support slides up and down. a swivel head of some sort... and you could add some thick foam blocks under your tripod legs, which would also act as shock absorbers.